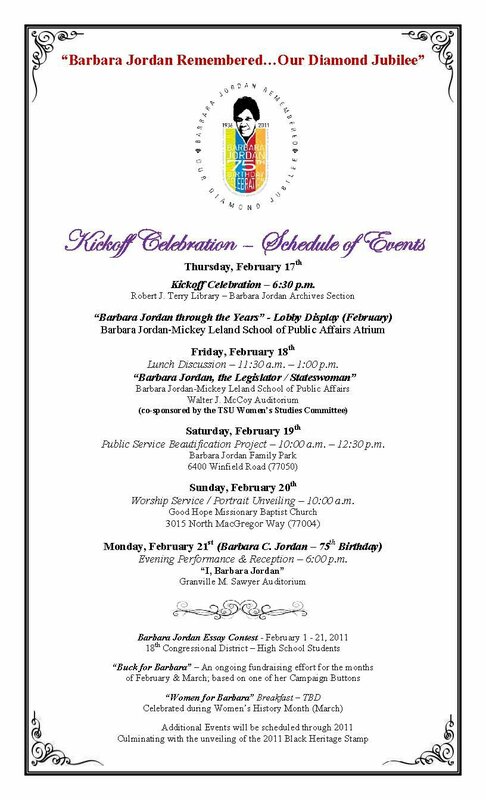 The Barbara Jordan/Mickey Leland School of Public Affairs at Texas Southern University is hosting a series of events to commemorate the 75th birthday of Barbara Jordan. The events will kickoff this Thursday evening at the Robert J. Terry Library at TSU with a reception from 6:30 to 8:30pm. There will be speakers, free food, and a look at the life and career of Jordan through her archives. Everyone is welcome to attend. There will be additional events happening this Friday, Saturday, Sunday and next Monday at TSU and around Houston—a schedule of events is posted here. For more information, please feel free to contact Gary Chaffee (chaffeegj@tsu.edu, 713-313-7298), or the School of Public Affairs at 713-313-6849. We hope to see you there! This entry was posted in Announcements on February 16, 2011 by amobley.